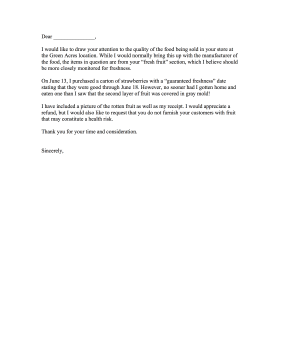 Intended for grocery stores but also suitable for restaurants, this complaint letter addresses spoiled and rotten food. I would like to draw your attention to the quality of the food being sold in your store at the Green Acres location. While I would normally bring this up with the manufacturer of the food, the items in question are from your "fresh fruit" section, which I believe should be more closely monitored for freshness. On June 13, I purchased a carton of strawberries with a "guaranteed freshness" date stating that they were good through June 18. However, no sooner had I gotten home and eaten one than I saw that the second layer of fruit was covered in gray mold! I have included a picture of the rotten fruit as well as my receipt. I would appreciate a refund, but I would also like to request that you do not furnish your customers with fruit that may constitute a health risk.